Level 3 (Advanced). 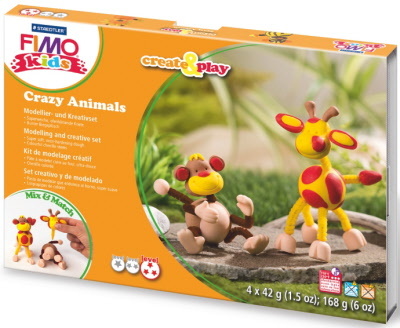 'Crazy Animal' creative set to make the illustrated monkey and giraffe. Suitable for more able young crafters. Includes 4 FIMO kids 42g clay blocks to make the toys shown and a modelling tool. Contents: 4x FIMO kids 42g - Yellow 1, Flesh 43, Light brown 71, Glitter red 212, coloured chenille wire (pipe cleaners) modelling tool, instruction. Age 8+.